Since I read the recipe on the 3 Foragers' blog, I've been wanting to make Japanese Knotweed bread. Basically it's the same recipe as for the muffins on their site, but doubled. 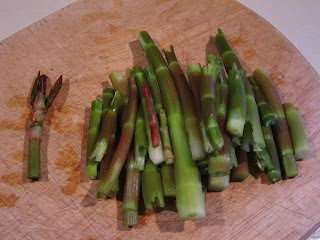 After gathering some knotweed shoots at the stables yesterday I washed them and chopped them today and had only one cup. To double the recipe, I needed a total of 4 cups. So I went out to the bike path and found a spot where there is a lot of knotweed and started cutting. What no one really mentions is that foraged food seems to take more effort to prepare. Either you have to blanch it, or peel it, or cook it in several exchanges of water. It's a lot of work! So while this is fun and still a novelty I will continue to do it, but if there ever reaches a time when the work outweighs the fun I might pass. Today, with the knotweed, I came close. I spent an awful lot of time standing at the sink, peeling knotweed shoots. But I do think the effort is worth it, the batter tasted good and the bread smells terrific. I am waiting for it to cool to try a piece. Strangely enough it made 2 loaves, not one. Not sure why, but I'm fine with that. While the bread was baking I made stuffed shells using some goat cheese I made a few days ago and some of my frozen nettles. I mixed the goat cheese with parmesan, shredded mozzarella, 3 eggs, salt, pepper, and fresh parsley and stuffed 5 shells with this mixture. Then I added chopped nettles to the rest, just a half a cup, and stuffed the other 15 shells. I am expecting that the 6 year old will not be interested in the nettles. This will be baked with a tomato-meat sauce and more cheese on top - 400 degrees for half an hour. The reason I used the goat cheese is that it came out runny (again) and I don't really know why. I think I will need to get some cheese starter and use that instead of the lemon juice. But I couldn't spread it on anything so it seemed like I needed to use it in something. What a perfect post and interesting reading! Well done, Donna! Are we going to see pictures of the bread? I would love to! Alas, the first loaf was eaten and the second is in the freezer! Think banana bread, but with flecks of olive green! I didn't know you could make bread with weeds. I always do organic weed control in my garden, not knowing I could have used them in my kitchen. Now I'll have to try it, too!